A few months ago there was a rather scary moment at the Town & Country market that many of you may remember. One of our regular customers and a long-time friend of Bob’s, Bill Miller, had a heart attack as he was backing his car out of the parking lot. Thanks to the quick thinking and actions from our cashier Chris Davia the moment was frightening but not tragic. Chris had recently viewed a video on compression-only CPR that he learned about through the Boy Scouts of America. After witnessing Bill in distress, Chris did not hesitate to take action and put what he learned to use. Emergency responders at the scene and the doctors at the hospital all confirmed that it was because of Chris Davia’s actions and proper administration of CPR that Bill’s life was saved. Last week, the Boy Scouts of America awarded Chris with the prestigious Medal of Merit at their National Court of Honor. 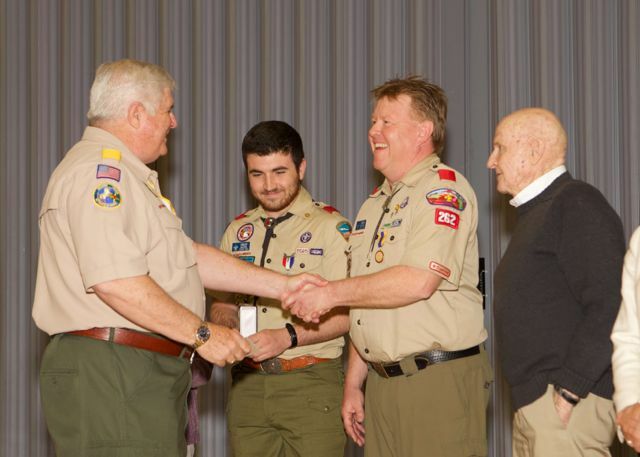 As a long-time volunteer in scouting and the father of two Eagle Scouts, it was a wonderful way to recognize and celebrate Chris and his actions that day. Both the Peoria Times wrote about the award (link is here) and Channel 12 did a piece on their EVB Live broadcast (video link is here). The best part of the evening was that Bill was there to stand next to Chris as he received the honor. To view the video that Chris saw on compression-only CPR, you can see it at http://heart.arizona.edu/cpr-video. The video only takes six minutes to watch and the information is invaluable. We add our congratulations to Chris who exemplified what it means to be a Boy Scout! We are glad you are part of our team!